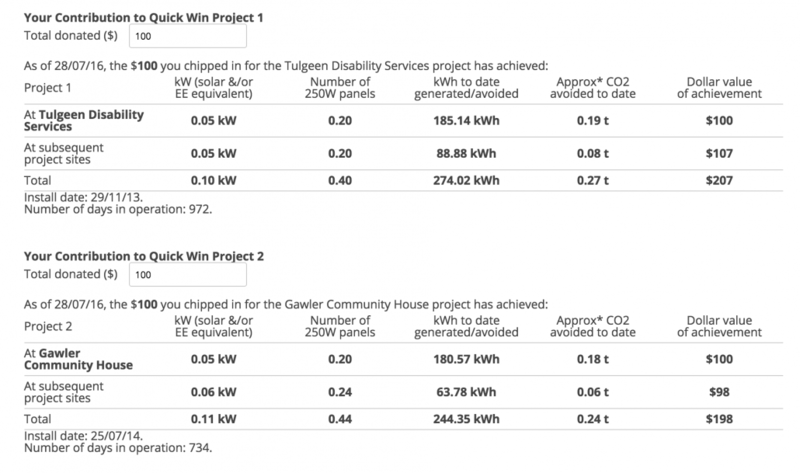 CORENA has just completed its 13th project, 6kW solar for Kulchajam at Byron Bay, and are halfway through funding a large solar project for Tastex, a Tassie knitwear factory that employs people with a disability. CORENA punching out new project almost isn’t news anymore, so we’re reporting on what their unique revolving fund means in practice. We all understand intuitively that a revolving fund means money is used again later on in other projects and should make it easier to fund subsequent projects, but how much benefit is it actually? Obviously it will vary depending on project size and the amount of time between projects, but the chart below shows what has happened so far for CORENA projects. The chart represents a total of $127,325 of newly donated funds and a total of $42,536 in loan repayments to date. The table below shows is a screen-shot from CORENA’s newly released Impact Calculator and shows how much benefit has been achieved so far from a donation of $100 to either of the first two CORENA projects. Neither has finished repaying its interest-free loan yet, but the impact of the original $100 has roughly doubled already. How? 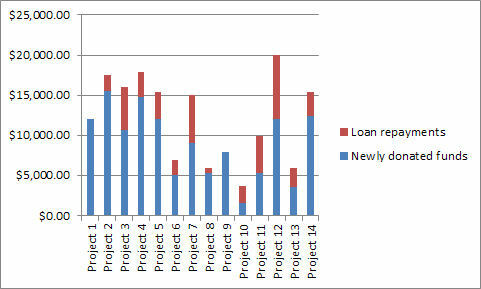 Direct loan repayments from Project 1, for example, have helped fund many subsequent projects, but in addition, at least some ‘Project 1 money’ has also been in loan repayments from those subsequent projects. So far 83% of the money originally donated to Project 1 has been used a second time via direct loan repayments from Project 1. However, some of the money originally donated to Project 1 has now been used 3 or even more times. Project 1 money accounted for 14% of the loan repayments from Project 2, 4% of repayments from Project 3, and 1.5%, 2%, 2%, and 0.3% respectively of repayments from Projects 4, 5, 7, and 11. Of course, even after both projects have finished repaying their loans, and even after those projects reach the end of their lifespan, that $100 will continue to be used again and again, so the growth in impact is primarily just a function of time.